Somehow I woke up in the early morning feeling much better and able to finish out the convention itself. We spent the majority of the morning packing up since the room we were in was slated for check-out today; we wished that the room lasted through Monday but Nate needed to be back at work the next day. However, Brandon, Ryan, and I had a plan - after I drop off Nate at the airport, I would rendezvous with the two along with Nick, Dalton, and his girlfriend/fiancée Ashton over at their hotel room and stay with them for a night before heading home Monday. We tried to get everything all in before at least 9:30am because we had one last interview we needed to conduct with Gen Urobuchi, Digitarou, Koh Kitaoka, Takanori Aki, Yi-Tsun Hsiao, Liang-Husn Huang, and Chen-Ching Ting for Thunderbolt Fantasy. We thought we could squeeze in some questions for Urobuchi-san not related to Thunderbolt Fantasy regarding Fate/Zero, Aldnoah.Zero, and/or Madoka Magica but the moderators for the interview wanted to keep the questions strictly about Thunderbolt Fantasy, which was fine with us since we had some backup questions related to the show. This would be the second time that the press team would split; Nate and I would conduct this interview while Ryan was covering the Gundam Model Contest judging and awards especially since he and Brandon had submissions for the contest. What made this interesting was that most of these interviews were billed as "group interviews" but if you've seen all of our videos of our interviews, they all have been one-on-one. So we were shocked when we heard that it would be us interviewing Japanese Guests of Honor one-on-one, well technically two-on-at-least-five. After the interview, we are approached with an opportunity to record the PILI Budaixi panel by the request of one of the guests of honor. The panel was at 2:30pm and ran for an hour; we had planned for Nate leaving downtown around 4:00pm since he wanted to be at the airport early to beat out Easter traffic and the drive between downtown and the Seattle-Tacoma International Airport takes at least around 20 minutes so it played right into our schedule. With some time before we really needed to clear out the room because all of our interviews have taken at most half an hour, we go check up on Ryan to see how the judging was going but there was no ruling yet. So we decided to go up back into the room one final time, clear out everything, and check-out. Before Nate left, he wanted to try out the Nitro Cold Brew. We found a Starbucks on the way back to the convention center, so we stopped in and tried the drink. This version of cold brew, compared to the standard cold brew, packed an extra punch both in smoothness and caffeine. 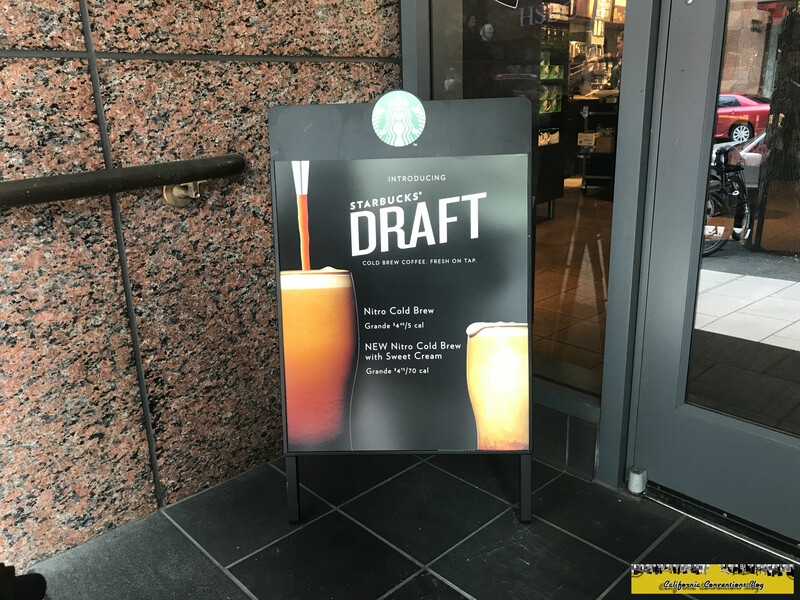 I wanted to order a Venti or a Trenti but the biggest size you can get is a Grande due to the caffeine content, and the baristas have the ability to cut you off like a bartender if you've had one too many of these brews. 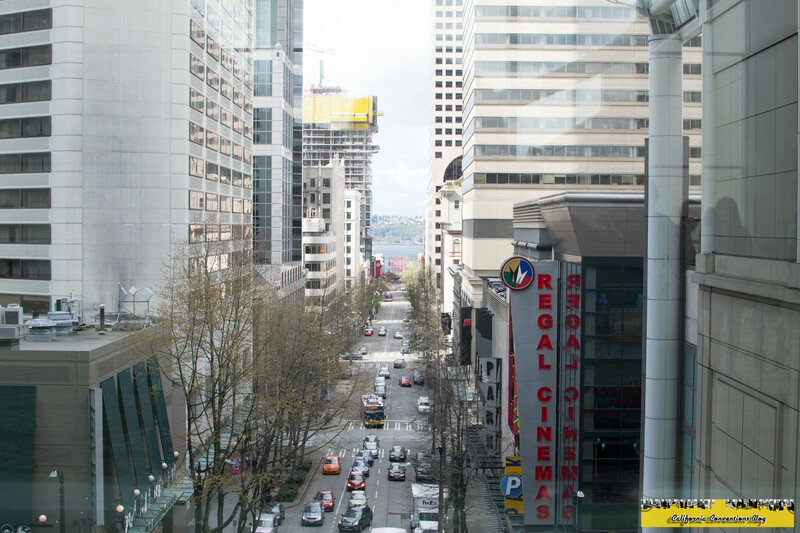 This time around, we took the long way back to the convention center walking past the Sheraton Seattle and up Pike Street. Back at the convention center, we find out that Ryan placed second in his group - not bad for someone who was looking to enter just to get critiques from those who have been in this sort of competition. We still have plently of time before the panel, so Nate and I kick off a project that we've been planning the entire weekend: interviewing attendees, especially those who are from the Pacific Northwest, about Sakura-Con, what makes this convention special, and how it stacks up to conventions in California like Anime Expo and FanimeCon. So we post up near the Altrium Lobby to pull attendees to ask them these questions. 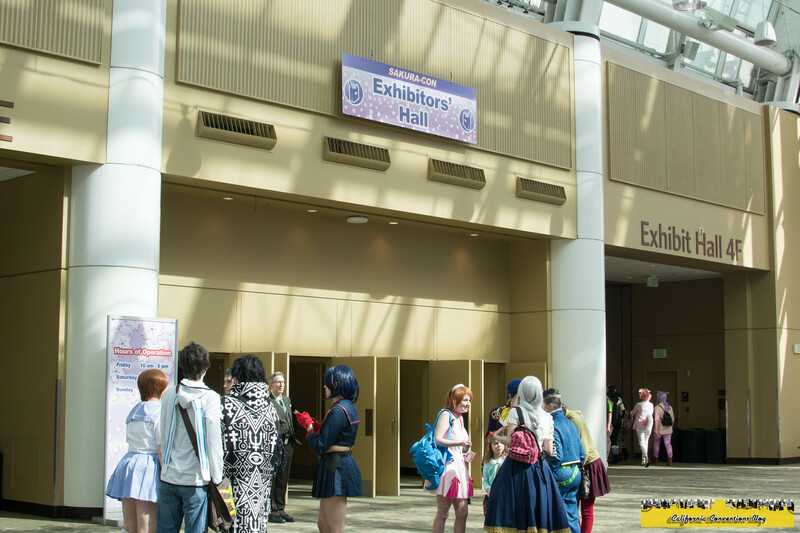 We thought it went well, although it was mixed in terms of where people resided from which made me think that Sakura-Con has that much pulling power to be on the national convention stage. 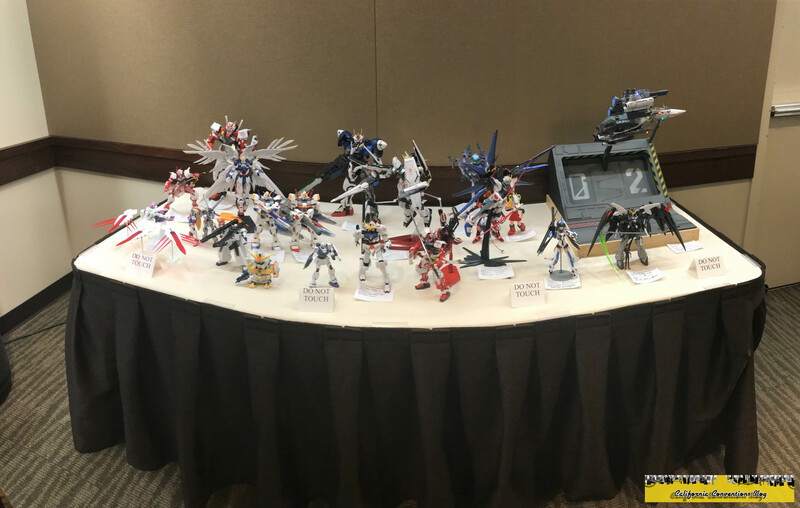 I used the term "Power Five Anime Conventions" (named after the Power Five conferences used to describe the five best conferences in college sports) and placed this convention in that conversation along with Anime Expo, ACEN, A-Kon, and Otakon in terms of prestige and influence, maybe we include attendance numbers but sometimes those numbers don't tell the full story. The two of us arrive just in time to set up our equipment for one last run at our convention reporting before we all have to leave. We ask them if we could live-stream the panel, and the staff give us the ok. But before we go live, one of the staff members asks us for our card, which we had. She then points to our Facebook page where we would be live-streaming the panel and shared our page to the thousands of Thunderbolt Fantasy fans across the world. When I say that we hit a goldmine, we sure did in that forty minute plus of recording as we were opened up to the Chinese and Taiwanese fanbase as our views, comments, shares, and reach skyrocketed to levels that we haven't seen before and was hoping for these types of numbers when we started to live-stream at this convention. Nate says his good-byes to everyone in the hallway outside the panel room as we book it back to the car and leave the Renaissance Seattle for the final time. All of us contributed to a playlist on Apple Music that would tell the story of the entire convention - from the Gravity Falls theme song with our first ever visit to Oregon to Future's "Mask Off" for everything Persona 5 to all the grunge rock songs that defined the scene to signify our visit to Seattle and the state of Washington. But there was one song that I was forbidden to listen to until I left Medford, or at least Nate left Seattle: Dropkick Murphys' "Until the Next Time." Obviously Ryan knows how emotional I can get when it comes to the end of the conventions. This song combined with Lukas Graham's "7 Years" and Drake's "Do Not Distrub" tell about family bonds, how far we've come in covering conventions, and what at least I'm expecting in the near year or so. Seriously, who left the onions in my car? Once I drop off Nate at the airport, I head back to Seattle for the first time with just me in the car. For those twenty minutes heading back, it felt like bliss to enjoy the scenery and reflect on the song choices that we really drove home. At the hotel where Nick, Dalton, and Ashton are where the remaining three of us were also going to stay, we rest up before heading back towards the airport, but instead towards Westfield Southcenter, a mall that contained the remaining festivities of the day: Jolibee and Round 1. However, we got delayed for quite sometime but were able to get out there just in time to enjoy Jolibee right as they closed for the night. Of course, those who haven't tried Jolibee yet were in for a meal that yells "home." And yes, this is much better than KFC although Popeyes right up there in the fried chicken rankings. One of my primary goals at Round 1 was to battle some of the locals at Wangan Midnight Ginkai no Speed Star Maximum Tune 5 but despite planning both on Discord and Facebook, due to the delay most of the people that I wanted to battle had gone home due to Sakura-Con fatigue but it was still refreshing to put in some work beating another player three in a row. 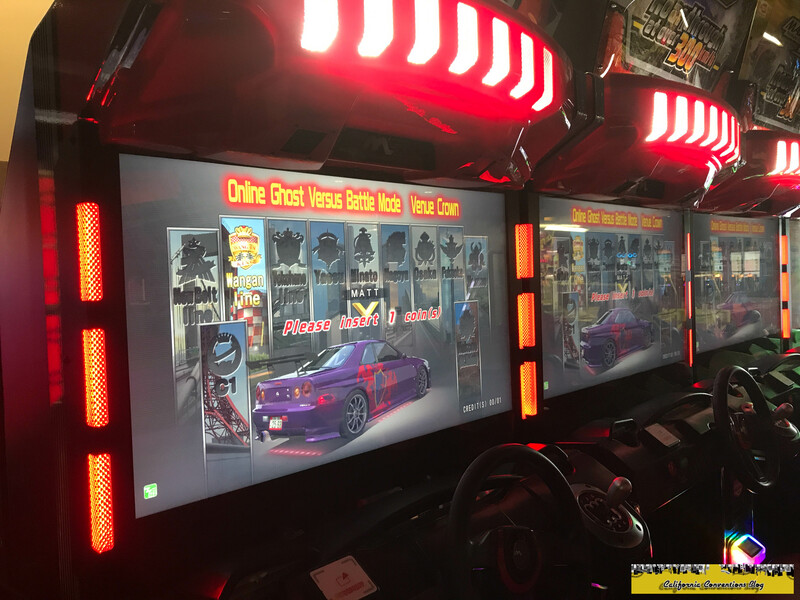 I also helped Ryan start his R34, giving him his own card loaded with a discard, so that he could start from 600HP/B on Chapter 21 instead of Chapter 1, to play since I had a feeling that the place would be sold out and the place where I call home, Roseville Golfland, have an abundance of cards. He also raced me against my full-tuned R34 and won - he'll say that he won cleanly but I sandbagged to get 2nd so that I could play another mode since winning kept you on and everyone kept putting in credits for a rematch. 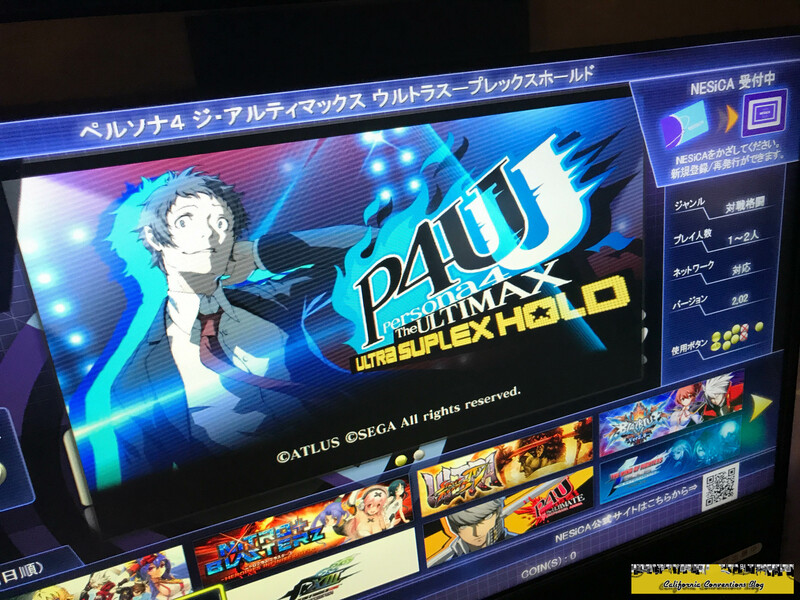 Other highlights including playing Gunslinger Stratos and Initial D Arcade Stage 8 for the first time ever and sitting down to play Persona 4: The Ultimax Ultra Suplex Hold, or as we would know it in North America Persona 4 Arena Ultimax. What made this cabinet special is that it was version 2.02 which contained all the DLC characters on the console version - Margaret, Marie, and Adachi - along with some re-balances to all the characters and making shadow characters more competitive; however, this version never made it to console even after the game was announced at Evo 2015, which forced the Japanese players to play on the outdated 1.10 version although it didn't matter as the Japanese players occupied all of Top 8. I started to play as Junpei, who I main in P4U, on arcade mode then Ryan starts to play as Kanji next to me. However, we couldn't figure out to play each other until I sat across from him and started to play against. I did go to Mitsuru first but totally forgot how to play her so I went back to Junpei. As we get into match point, both of us are trying to "instant kill" each other; Ryan notices that I've been relying on Junpei's slide move just a tad too much and had just started to punish it. I think I can go under him while he has his finishing move activated and avoid him, but I pop up too early, get caught, and lose the match. Before we all know it, it's nearly midnight and I need to get gas before we head back to the hotel because we need some sleep because someone has to drive eight hours back to Medford.